For those of you that have not seen Starship Troopers that reference just went over your head. Please do us all a favor and go watch it before continuing forth as this article will be littered with Starship Trooper references and SPOILERS. 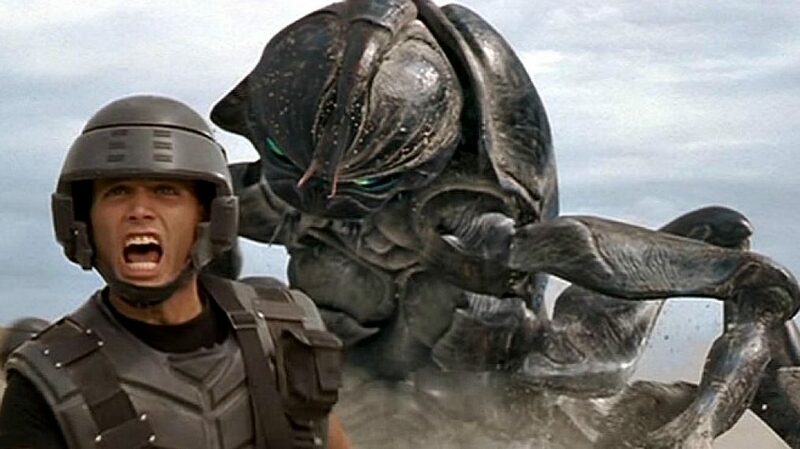 In the movie Starship Troopers, the Federation a fascist global government suffers a crushing defeat on their first invasion of Klendathu, the bug home world. Within an hour of the invasion over 100,000 soldiers die and it quickly becomes apparent that the Federation greatly miscalculated the strength of the bug menace. At this point you may be asking yourself why the hell am I talking about a fictional universe? Well the reason lies in the actions of the Federation following its defeat at Klendathu. In short, the Federation changed its strategy to compensate for the stronger foe. This allowed them to strike the bug menace where it was weakest and eventually led to a succesful war effort. Now let’s imagine the Federation decided their invasion force just wasn’t big enough and that with a few extra men they could conquer Klendathu and end the war right then and there. So they come back with another invasion force except this one is twice as big. Unsurprisingly they have their asses handed to them once more but lose even more soldiers this time around. The Sky Marshals meet up and have another discussion on what to do and they once again come to the conclusion that the previous invasion force just wasn’t big enough. So the Federation mobilizes every man woman and child capable of holding a rifle to launch one final invasion of Klendathu to end the war once and for all. But this surely has to work, because now the Federation is using more man power, ships and weapons than in the previous invasions combined. Of course it won’t but that doesn’t stop them from trying. The analogy I am trying to make is that the belief that The only reason the previous attempt failed because it wasn’t BIG enough is the exact same logic used by the Federation Reserve… err, I mean, FEDERAL Reserve not Federation. Whoopsie. Easy mistake. When the tech bubble burst in 2000 and the housing bubble in 2008, the Federal Reserve’s response has been the exact each time… Easy Money and Lower interest rates. Lucky for humanity in the Starship Troopers, the Federation did not follow this logic and indeed changed strategy in order to win the war. However, we don’t live in that universe. We live in a world governed by central banker hubris. Communism the epitome of central planning has been shown to fail with devastating effects throughout the 20th century but now that we are in the 21st century some how the Federal Reserve believes that this time is different. Now we all know the quote from Einstein “Insanity is doing the same thing over and over again but expecting different results”, but apparently the guys at the Federal Reserve still haven’t heard this quote. They continue the exact same tactics that led to the tech bubble of the 90’s and the housing and stock bubbles of 2000’s and now the housing, stock, bond, dollar and government debt bubbles of today. The question is why? Are they really that stupid? I mean they all have Ph.D’s and are well educated so why do they fall victim to this belief that this time it will be different? Before we can answer these questions we should examine the Federal Reserve’s tactics, the motives behind those tactics before finally deciding how we as intelligent and logical readers of this amazing blog written by an unemployed 25 year old who has never taken a finance course in his life can profit off their decisions. So… What are the Federal Reserve’s tactics? Well just look up. The chart above is all the information you need to see the Federal Reserve’s tactics – low interest rates and easy money. 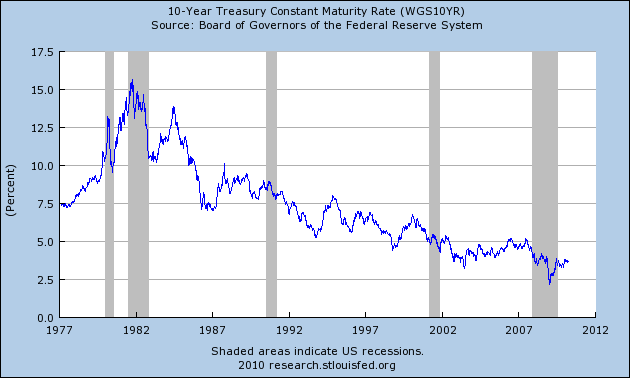 Over the past 20 years the Federal Reserve has lowered interest rates whenever the market saw something it didn’t like. Greenspan, the Federal Reserve Chairman who oversaw the tech bubble was actually called “the maestro” for his ability to quickly lower interest rates whenever the market got scared. He certainly orchestrated a catastrophic bubble. Why is this a bad thing? Low interest rates allow for money to flood the market place, and when there’s a flood more often than not the water or in this case money goes in places you don’t want to go. In Greenspan’s case this was internet and tech stocks. Each time investors started to actually think about what they were doing, the maestro would come in and shove more money in their faces. This worked for a while but it eventually blew up in his face when the stock market crashed in 2000 which is the equivalent of the Federation’s failed invasion of Klendathu. Now do me a favor. Look back up at the chart. What did the Federal Reserve do following the crash? Well they certainly didn’t do the same thing that caused the tech bubble in the first place that’s for sure… Oh wait. What? They lowered rates even more? Wait why? Why the hell would they do something like that? Seriously? That would be like the Federation trying to invade Klendathu again and then the human race would lose the war to the bugs! NOOOOOOOOOOOOOOOO! But seriously, why did they lower interest rates even though it was low interest rates that were the reason for the tech bubble to begin with? This question brings me to my next chart. Reader this is government debt bubble, government debt bubble this is reader. So as you can see back in 2000 we had a debt problem. A $6 Trillion debt problem. An important lesson can be gained here. After the 2000 market crash we had to lower interest rates because we couldn’t afford our debt. Now if we couldn’t afford a $6 Trillion debt what makes you think we can afford a 17 or 18 or 19 Trillion dollar debt? The answer is obvious, we can’t. And this is where we examine the motives behind the Federal Reserve’s tactics. Just like they are now, at the peak of the tech bubble, Americans were very highly leveraged so when the crash came around they were forced to sell a lot of assets to pay off their debts. The massive sell off lowered prices. Then when people lost their jobs and couldn’t spend as much reducing demand further added to the deflation. So now the dollar can buy more than it used to. Despite what the government says THIS IS A GOOD THING FOR PEOPLE. However, I will skip over this because deflation’s value for people isn’t important for the purpose of this article. What is important is that deflation is the equivalent of stage four lung cancer for a highly indebted government like the US Government. So why is deflation bad for governments with high debts to GDP? When prices fall, then spending falls and wages will stagnate or even fall. So this has two major effects. The first is the government loses tax revenues and therefor cannot pay off its debt. The second is that GDP will fall as well. So government debt as a ratio to GDP will increase. If this goes on long enough, the debt to GDP shoots through the roof and the government is forced to default which is exactly what happened in Greece. Once again I’m going to skip over the benefits of this because if politicians actually cared about the future then they would allow this to happen. Politicians think only short term. How can they make people happy enough to get elected. And unfortunately short term a sovereign debt crisis is very bad. Why? Because structural reforms have to take place and the status quo changes. Unlike Greece though, the US Dollar is the world’s reserve currency. This is a very important distinction. Because if the US government defaults on its debt the entire monetary system on which it’s based could topple. Like anything the government does, there are unintended consequences, which brings me to the BUBBLES in real estate, stocks and bonds. These low interest rates and cheap money coupled with inflation have increasingly forced investors to put their money into riskier financial products in hopes of a higher return on capital to beat the inflation the government is promising to bring. Thus investors all over the world are assuming MUCH MORE risk than they normally would and creating bubbles in any high yielding financial product they can get their hands on. Just like the housing bubble of 2008 which only lasted 5 or 6 years depending on how you look at it. We are currently in year 5 of Quantitative Easing . So how long till the next bubble pops? I’m not sure but if history is any indicator we won’t have to wait too long and in which case we will get another crash but this time the government won’t be able to come to the rescue and will be forced to default. And don’t worry… Like Frank here, I haven’t forgotten about you. Everything up to now has been set up and gold is the punch line. If the government promises inflation, then you want tohedge against said inflation and there is no better hedge against inflation than physical gold. Gold does not rust and has been seen as a store of value for thousands of years. I will make the point that if you do decide to buy gold, make sure that it is physical allocated gold that you own meaning that no one else has a claim on it. Bullion banks around the world use fractional reserve lending the same way regular banks use currency there by inflating the paper quantity but not the physical amount. So in some cases 10 or more people could have “claim” to the same gold and when the market crashes the bullion banks reserve the right to settle your gold price in cash. If the US experiences deflation a number of catastrophic events will occur. As I stated earlier, if the US experiences deflation the USG will be forced to default. In the short term, the dollar may go a little further than it used to, once the government defaults the dollar will lose a lot of its value. So even in the event of deflation the dollar will still long term lose it’s value. And that’s what holding gold is about, long term wealth protection. The gold you own will always be gold. Central banks can’t print it and the world’s gold supply only increases by between 1-2% per year but when you think about how population increases by a similar if not greater amount that 1-2% increase is pretty negligible. As this has been my second posting within a week it is my hope that we will now see Unicorns and Fairy dust power the western world. I’ll eventually get around to discussing the housing bubble 2.0 but there’s still a trove of data I need to examine before make an informed post.